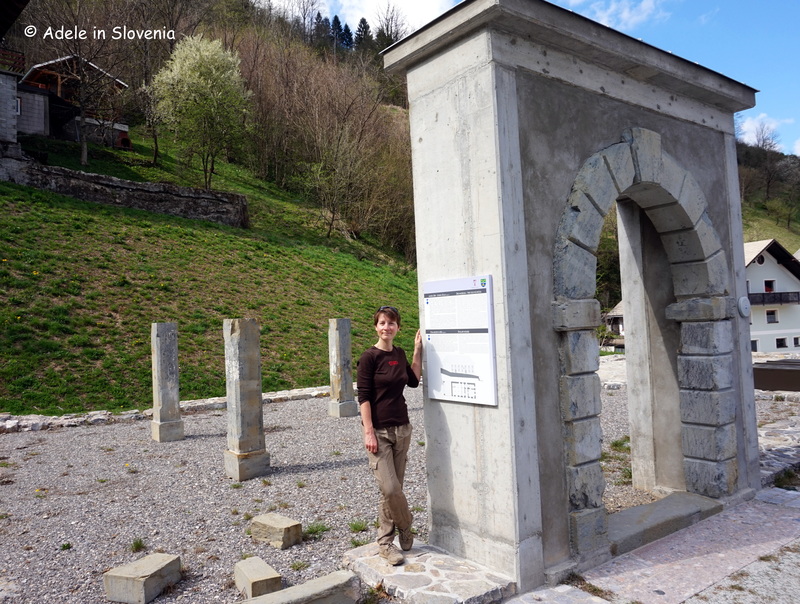 As 2017 draws to a close, so does another chapter in my exploration of another area of Slovenia – Škofja Loka, which I have explored the length and breadth of during the past year. As is customary for many at time of year, it’s a time for reflection on what we have achieved, and time to look forward to the next year and the challenges ahead. 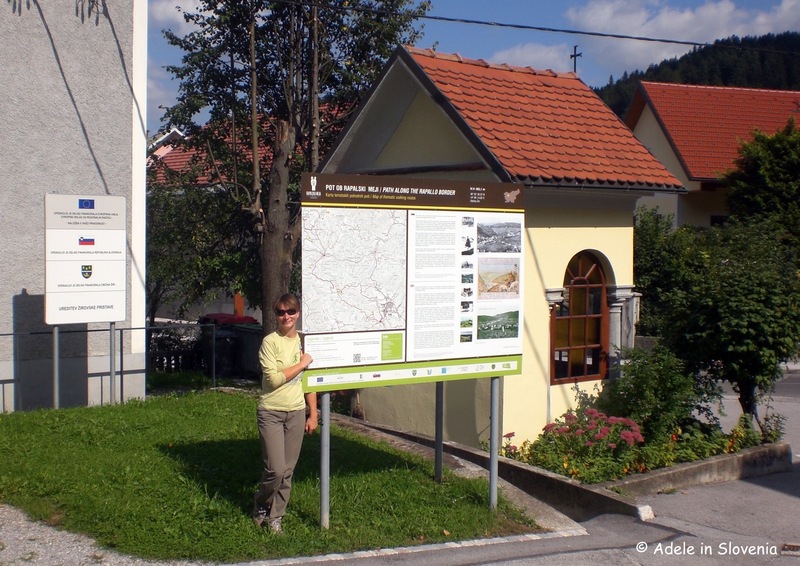 So, here’s a look back at just some of the highlights of my adventures in 2017 exploring Škofja Loka and the Selca and Poljane valleys, which I hope will also serve as inspiration for those of you planning a visit to the area in the future. 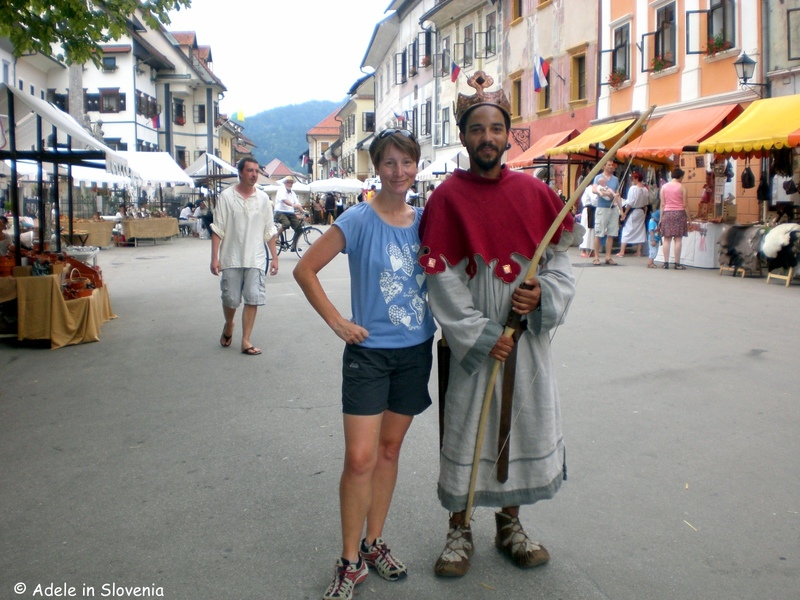 I began, as every visitor to Škofja Loka should, with a visit to the old town and a walk up to the beautiful Loka Castle. 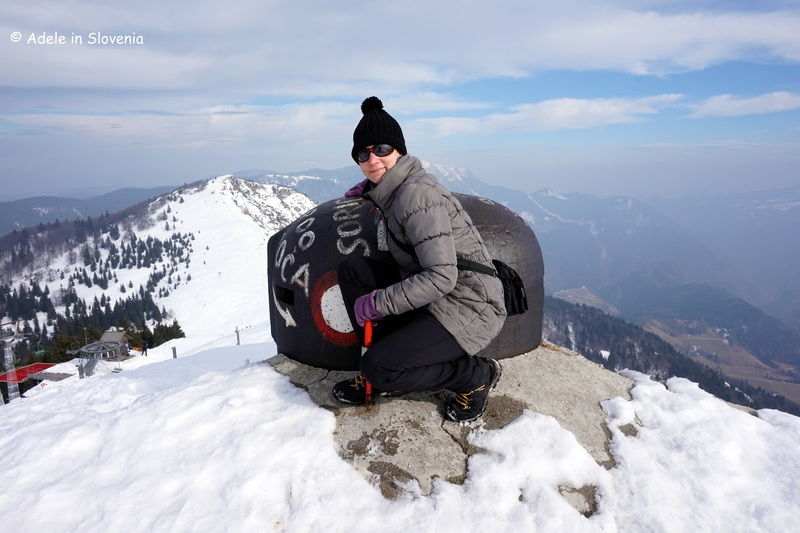 Then it was time to start exploring further into the area’s two valleys – the Poljane valley (Poljanska dolina) and the Selca valley (Selska dolina). Too numerous are the highlights to include them all here, but they are all there on my blog, and will remain so, for those interested in finding out (even) more about the area. 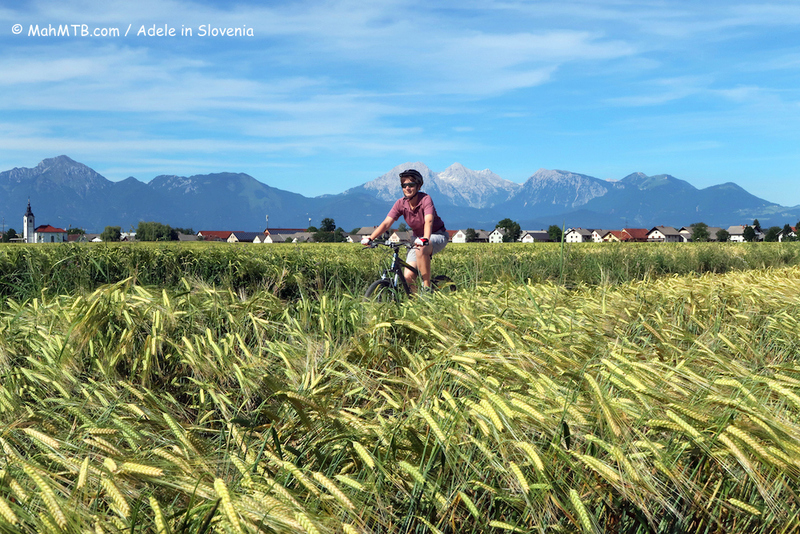 2018 will bring a new chapter in the Adele in Slovenia story, a new destination to be explored in-depth, albeit one I am already very familiar with, but one I can’t wait to get even more familiar with! Watch this space for more details very soon, and I hope you will continue to join my own my journey. 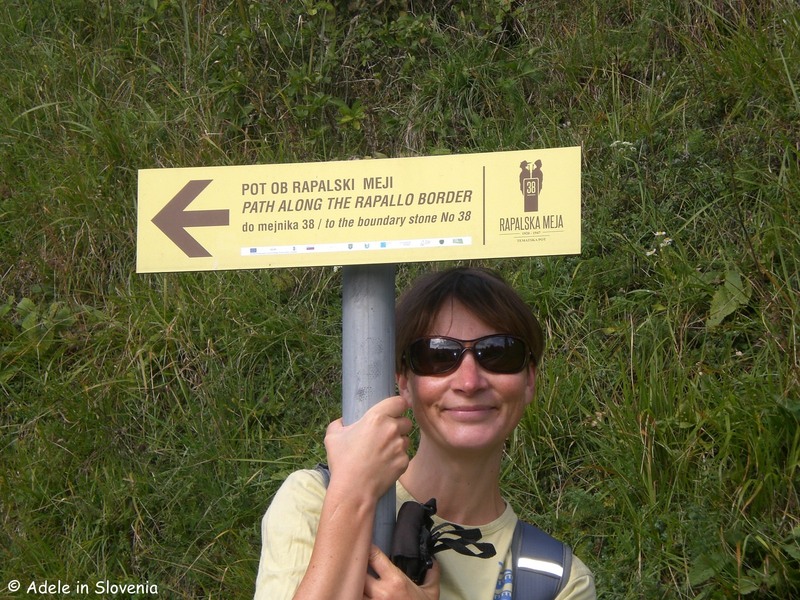 The Rapallo Border Theme Path has been designed to acquaint those who walk along all or part of it with the period between the 1st and 2nd World War and the effect the Rapallo border had on the towns and villages along its length. 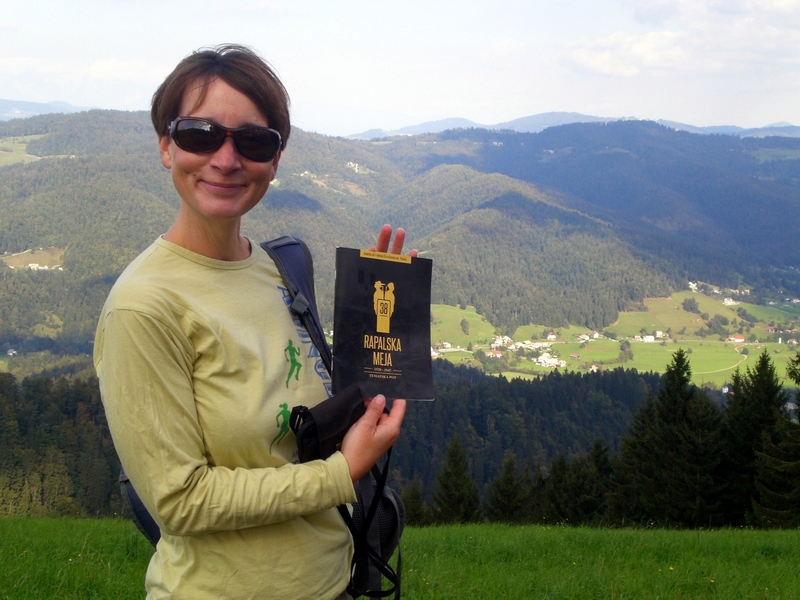 Armed with a copy of a leaflet giving details of the route and its history, I set off to explore! There is an information board opposite the museum. With your back to the board, head steeply – and I mean steeply! 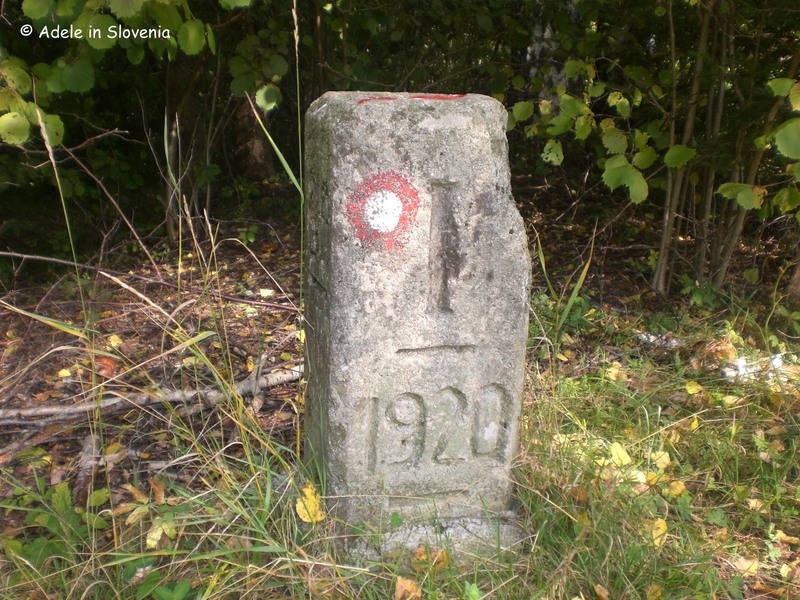 – uphill to Tabor and continue to follow the usual Slovenian hiking trail markers – a red circle with a white inner. 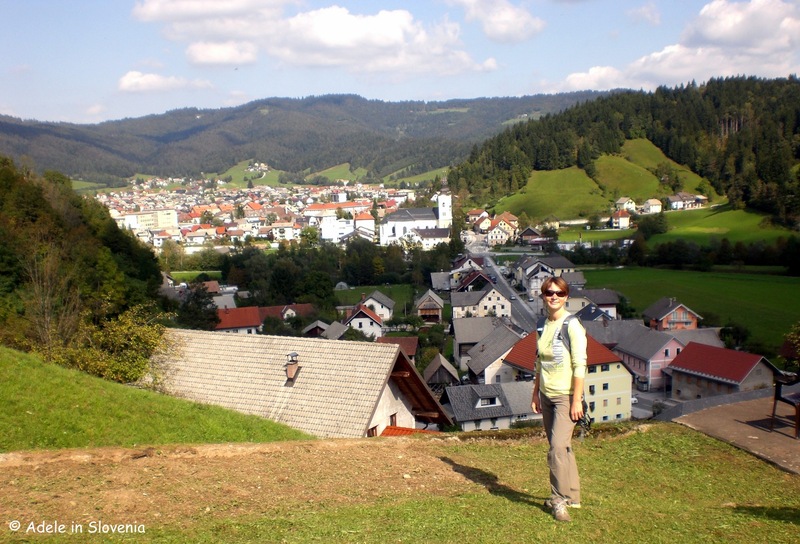 After just a few minutes you are already rewarded with a fantastic view over the town and valley. The Rapallo Border was established as a result of the Treaty of Rapallo that was signed on 12th November 1920 in the Italian town of Rapallo. The treaty required a third of the territory of Slovenia to be handed over to Italy. The effect on those living in the border areas was dramatic with neighbours, relatives and friends overnight becoming citizens of two separate kingdoms – the Kingdom of the Serbs, Croats and Slovenes (later the Kingdom of Yugoslavia), and the Kingdom of Italy. The entire border was 244km in length and was divided in 70 sections. At the start of each section there was a main boundary stone, with smaller boundary stones in between. 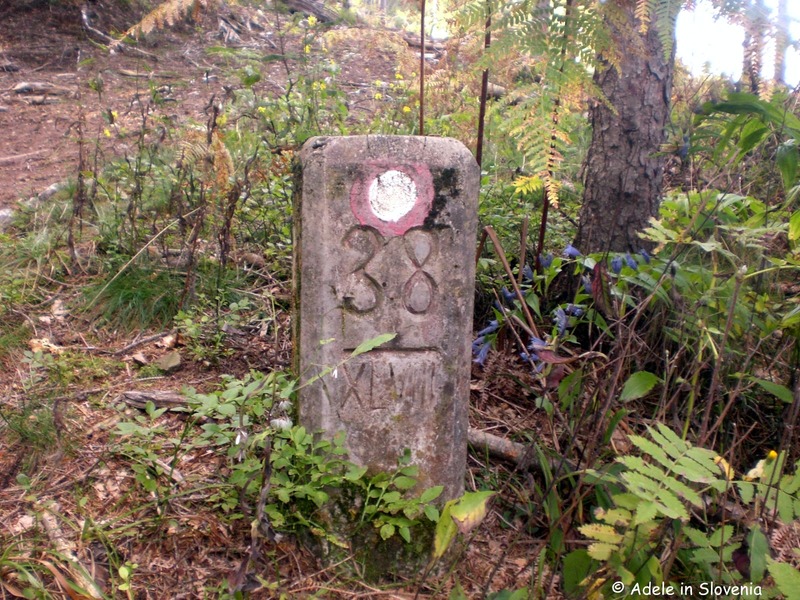 The Rapallo Border Theme Path covers the area of five main boundary stones numbered from 35 – 39. The path is rather, or very, sparsely marked in places, so do keep your eyes peeled for the red and white circles (on trees, stones, buildings, behind you, in front of you, etc.) as well as the odd yellow theme path sign. 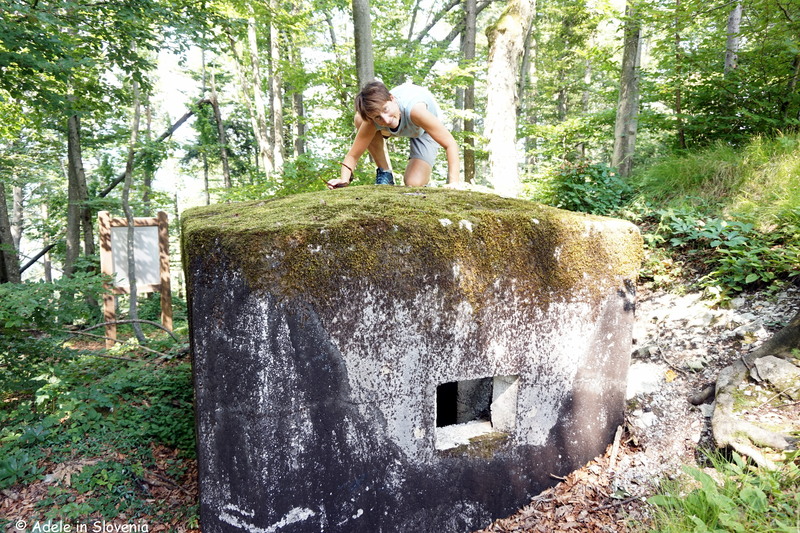 Alternatively, you could contact Visit Škofja Loka and arrange to arrange a guide, thus eliminating any such worries, and getting the added benefit of the chance to find out more interesting facts and figures from a local expert. 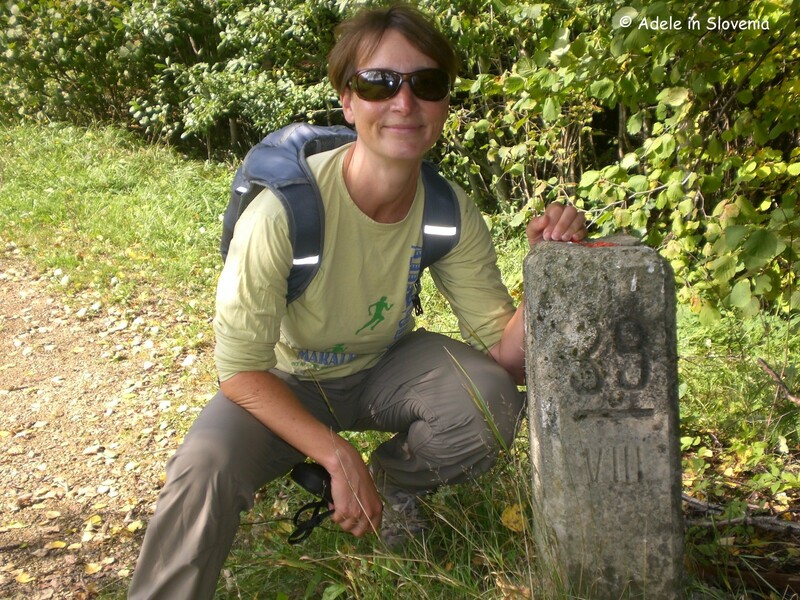 You could choose to walk its entire length (46km, 9-10 hours), or for a shorter, easier version, take the circular path from Žiri to Mrzli vrh and back, which is 13km and takes approximately 4 hours, with optional extensions to additional boundary stones. 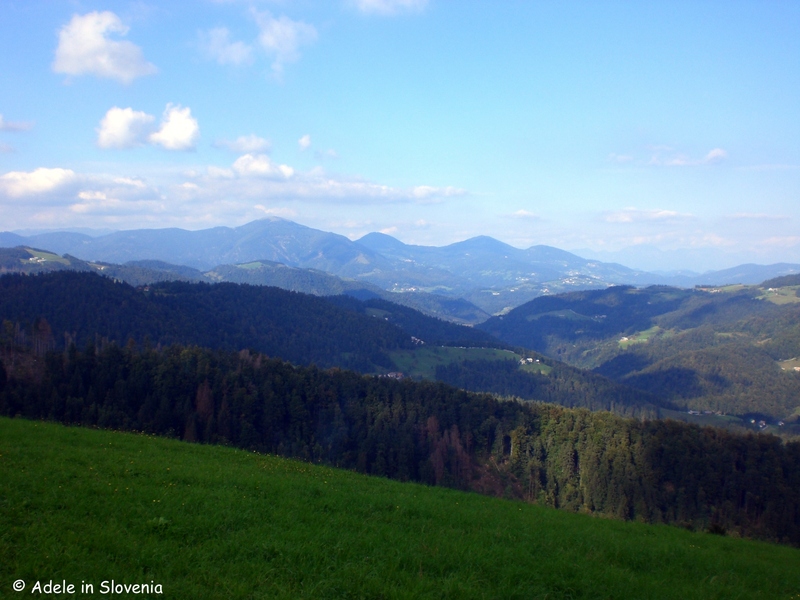 Shortly after leaving Tabor and emerging from the forest you are rewarded with another great view. ..whereas as first I walked straight past no. 38 as it is somewhat concealed by a tree and undergrowth! 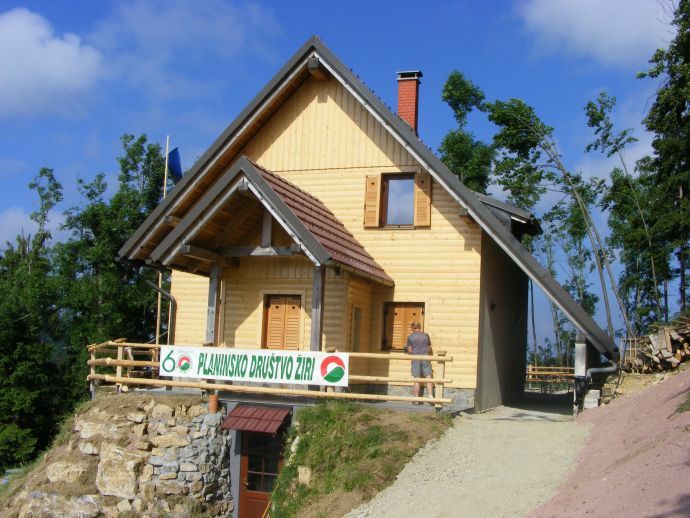 If you choose to continue to Mrzli vrh, at the village of Breznica the path descends a little on the road, before continuing upwards, at first on the road then again leading into the forest, towards the peak of Mrzli vrh and the Koča na Mrzlem vrhu mountain hut. The hut is open on Friday, Saturdays, Sundays and public holidays. 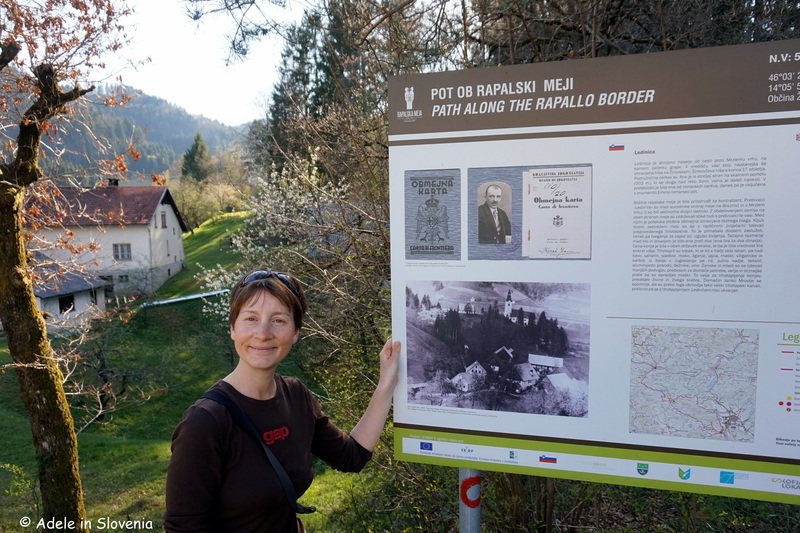 From here you could opt to return by the same route, or alternatively take the circular route via Ledenica to return to Žiri; the latter, however, means quite a few kilometres, though a pleasant walk, back through the valley to return to the museum. 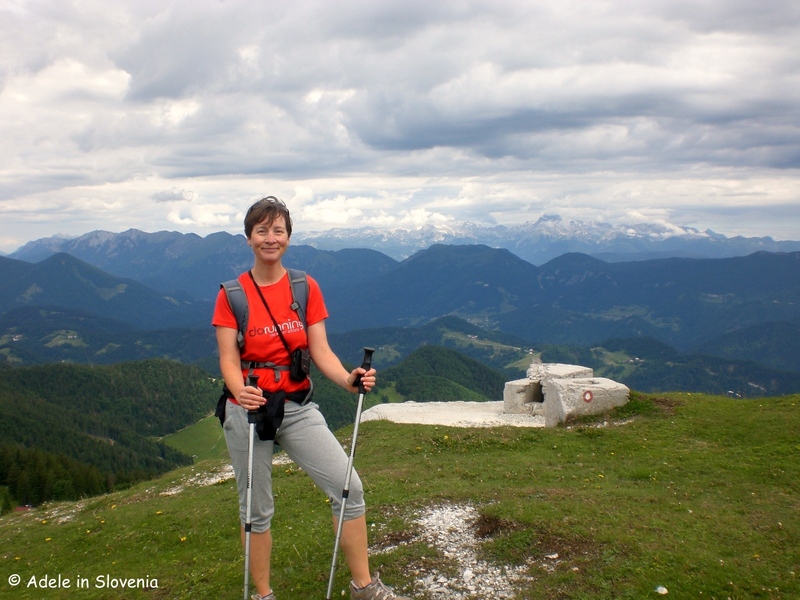 The views that accompany you along the ridge of Mrzli vrh aren’t half bad either! 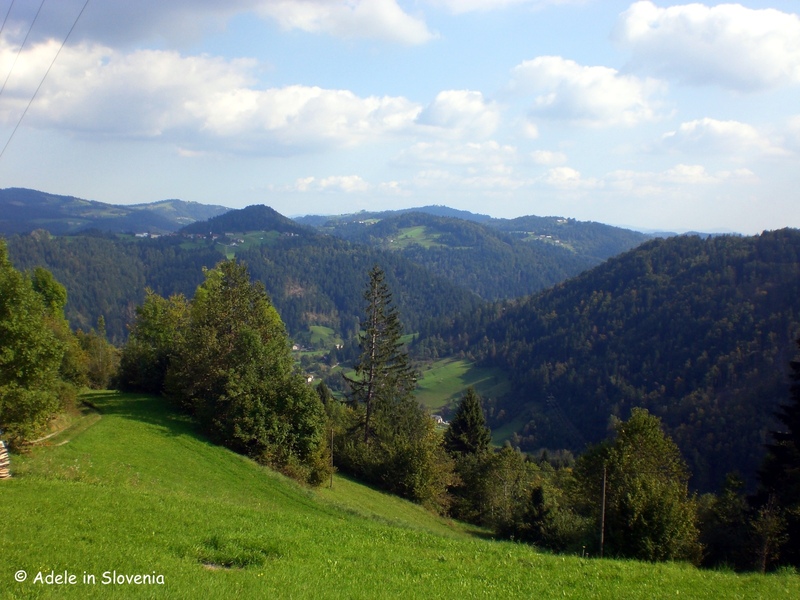 There is also an alternative start for the route which begins in Sovodenj and leads to Mrzli vrh (14km, cca.4 hours – one way), or you could walk a shorter circular route from Sovodenj to Nova Oselica and back (6km, cca. 2 hours). 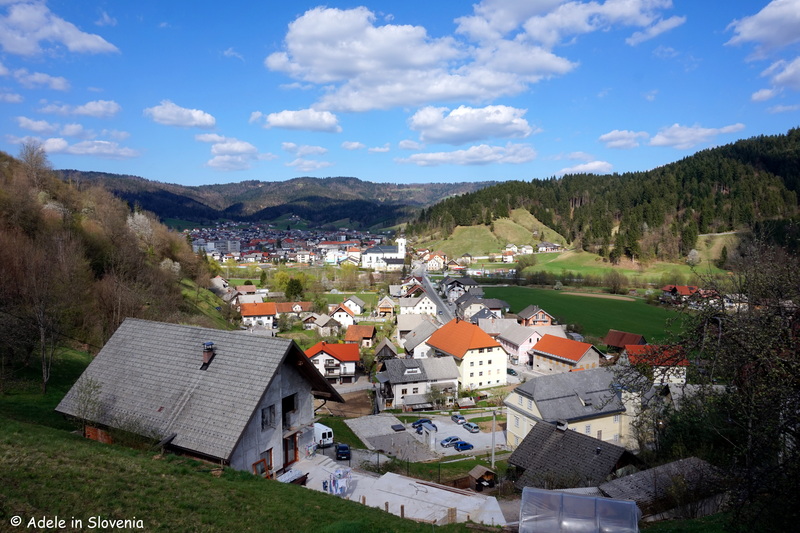 The town of Žiri, located 28km from Škofja Loka between the basins of the Sora and Idrijca rivers, is known, above all, for its long history of shoemaking and bobbin lacemaking, as well as its unspoilt idyllic location. 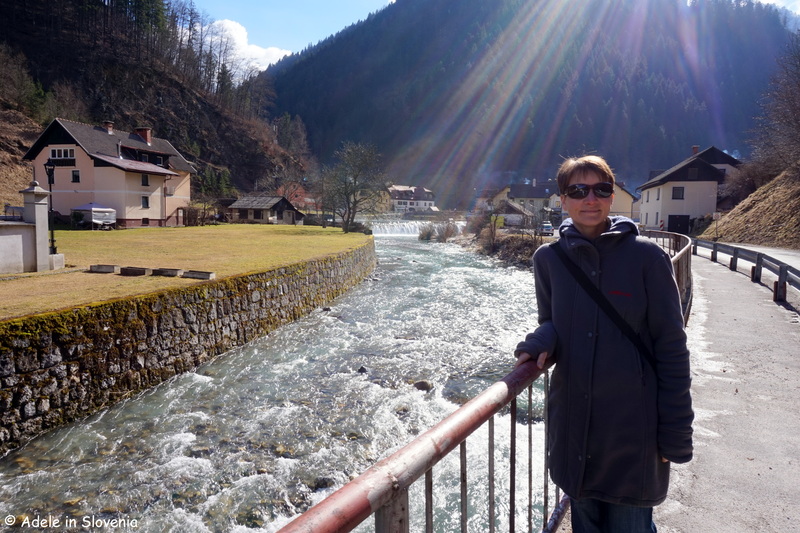 On the sunny spring Sunday when I visited, Žiri was about as scenic and tranquil as it gets, and I found myself wondering why on earth I hadn’t been there before! Granted, it’s not exactly ‘on the way’ to anywhere, thus it has always been slightly off my radar, but at the same time its location at the meeting point of 3 of Slovenia’s regions – Gorenjska, Notranjska, Primorska – makes it actually easily accessible and, from what I’ve seen of it so far (I fully intend to go back! ), it’s definitely somewhere that should be on my, and your, radar! 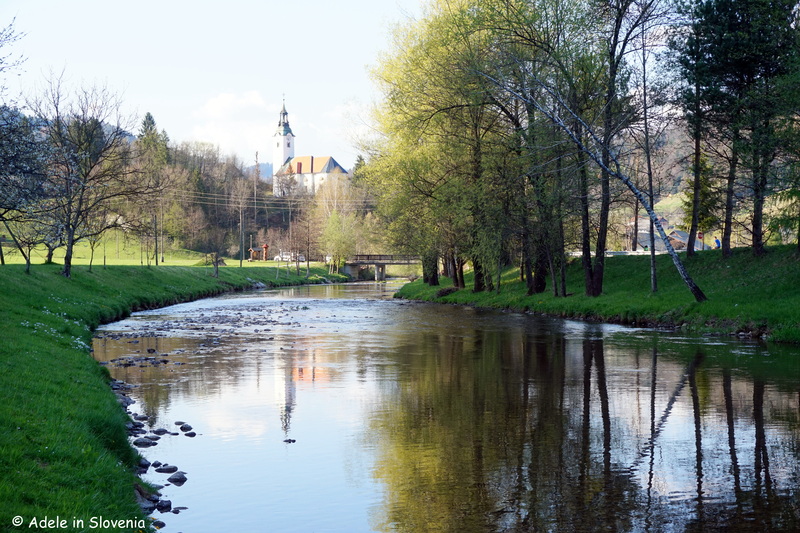 The best place to start to find out more about the town is at Žiri Museum, which since 1970 has been housed in the old school and former lace school, considered one of the town’s most beautiful buildings. 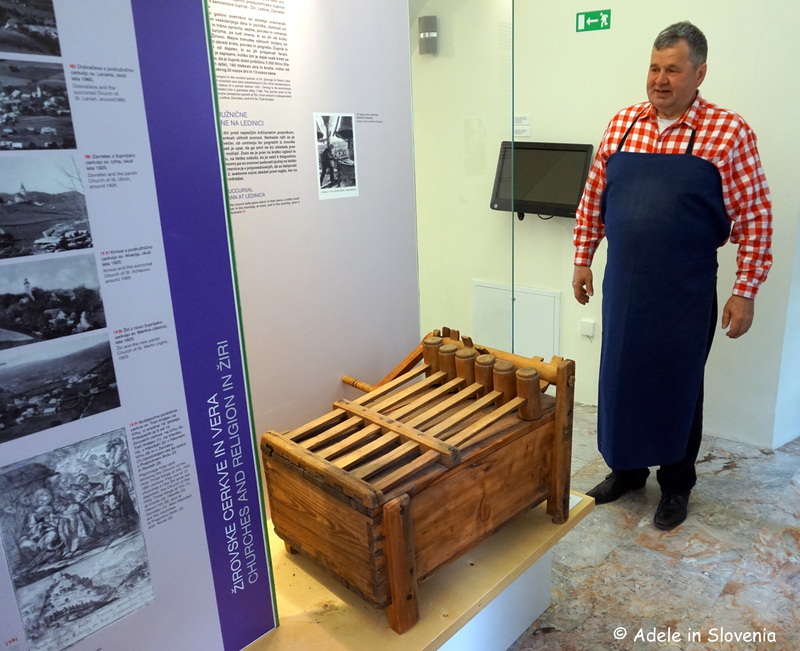 The museum has collections dedicated to the history of the town and its surroundings as well as its main economic activities – agriculture, bobbin lacemaking and shoemaking. 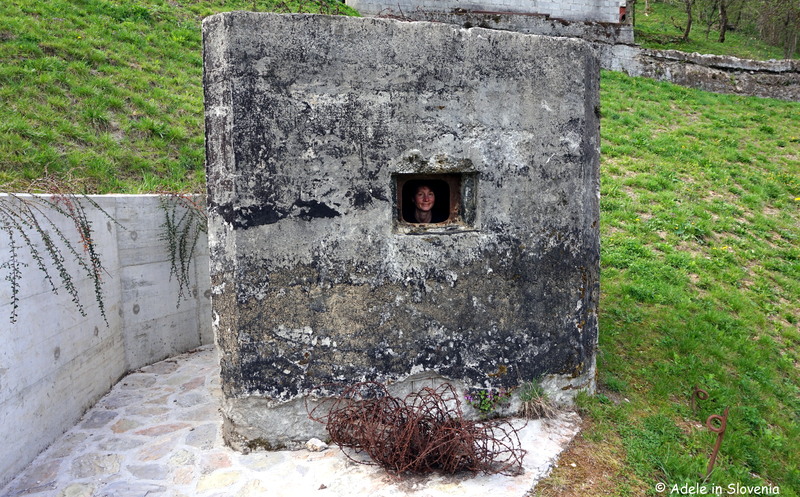 Before even setting foot in the museum there are exhibits to see, including fortifications of the former Rapallo border. The entire area used to be a lake and you can find out more about that through the museum’s exponents and exhibitions titled ‘Žiri and its People Through Time’, ‘Žiri’s Painters’ and ‘Welcome, Fortress Lovers’. 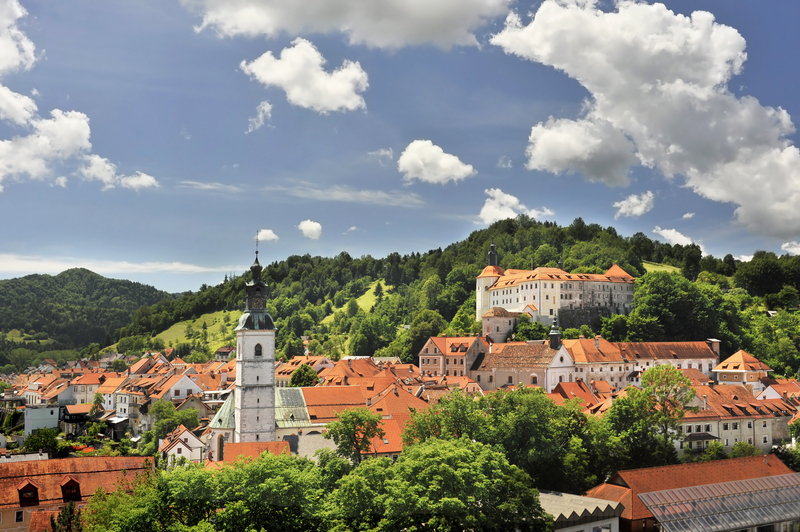 Another exhibition is ‘Shoemaking in Žiri’ – the town is home to the Alpina footwear factory. 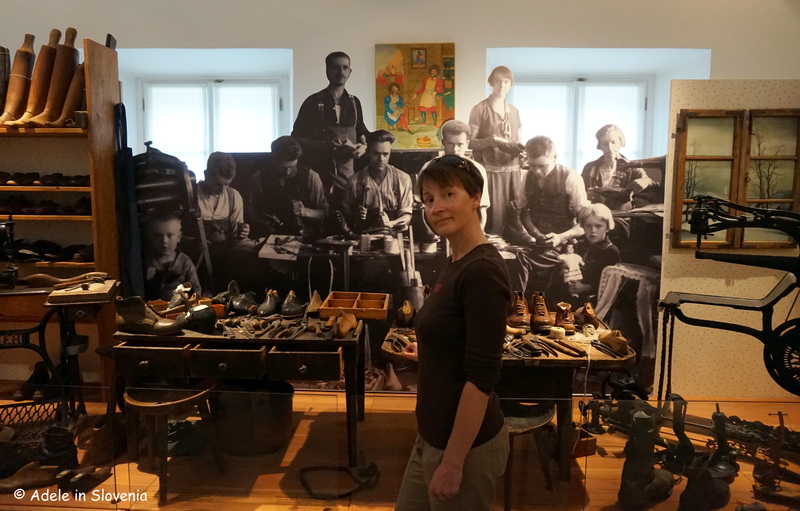 The craft began to develop in the town towards the end of the 19th century and although the ‘golden age’ of shoemaking in Žiri has been and gone – the majority of the shoemaking shops have closed – the Alpina factory is still going strong. 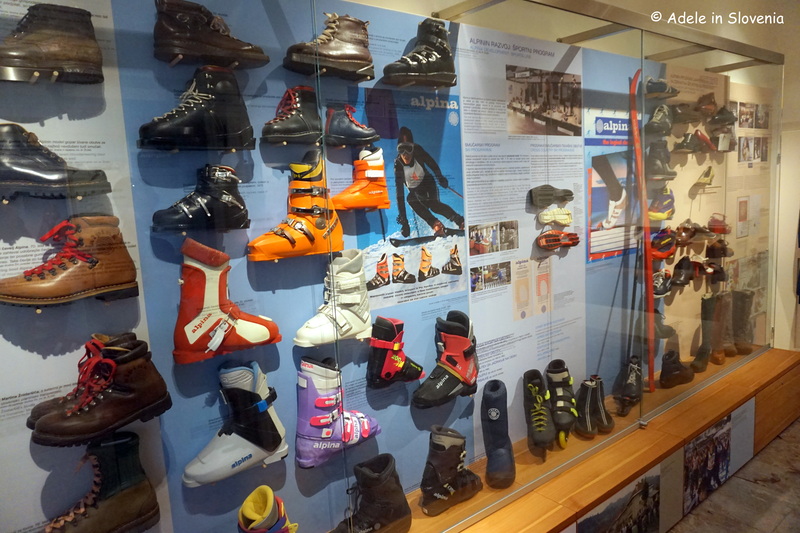 There are around 30 Alpina shops throughout Slovenia and their footwear is used by many top sportsmen and women. The other craft for which Žiri is known is bobbin lacemaking – it is one of the three centres of bobbin lacemaking in Slovenia. One of the highlights of the calendar year is Lacemaking Days (Klekljarski dnevi), which this year takes place from 27th April to 2nd May. The Cvetke Žiri Bobbin Lacemaking Association prepares exhibitions, workshops and competitions, and a chance for all generations to get an insight into this skilled craft. During the festival, the nearby Alpina factory also opens its doors and offers visitors footwear at bargain prices. 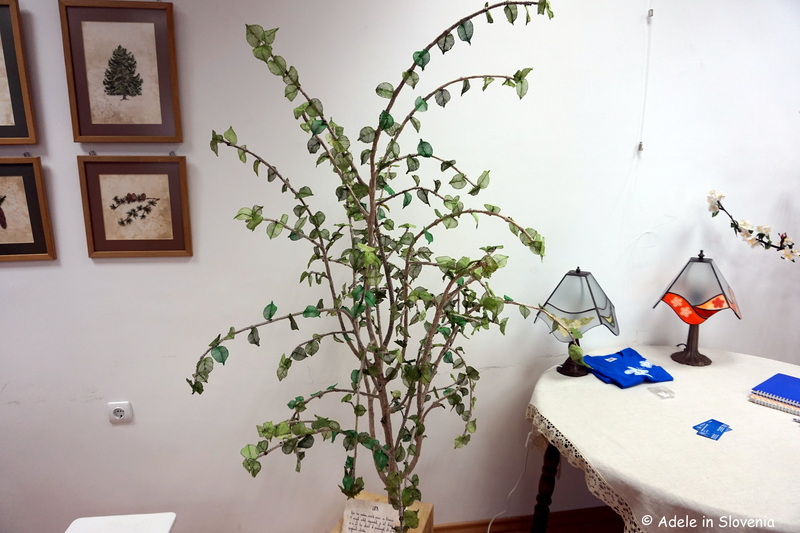 One of the exhibitions at this year’s festival is ‘Trees in Lace’, prepared in collaboration with the Slovenian Forestry Institute. 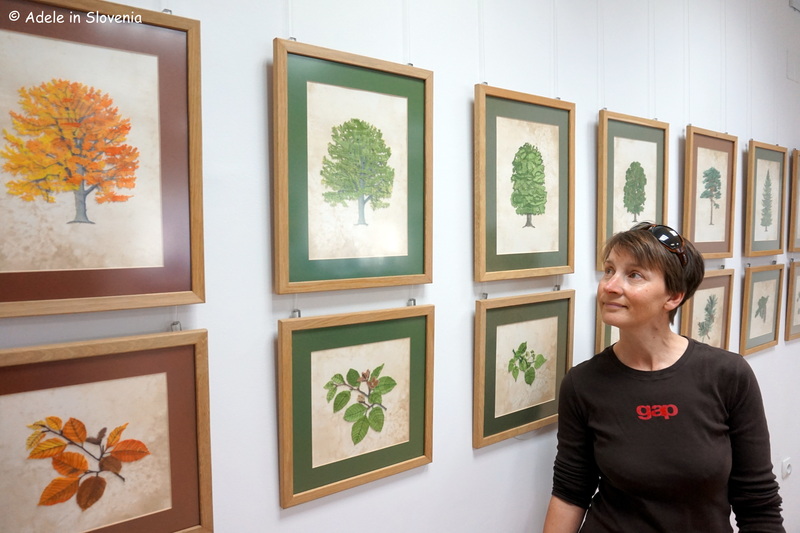 The exhibition comprises 12 tree species and their fruits, blossoms and leaves. Getting up close to the pictures, you can really see just how much work went into creating these intricate trees made entirely out of lace – each tree took 100-200 hours to make – and the exhibition has received an exceptional reaction wherever it has been displayed since it was opened in 2011 to mark the 70th anniversary of the institute. 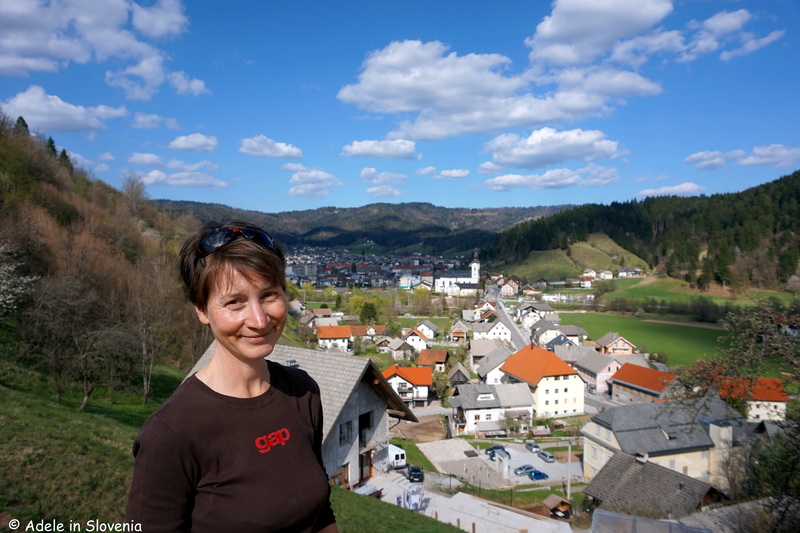 There are a handful of bars and restaurants in Žiri, among the most known and popular is the family-run Gostilna Župan. 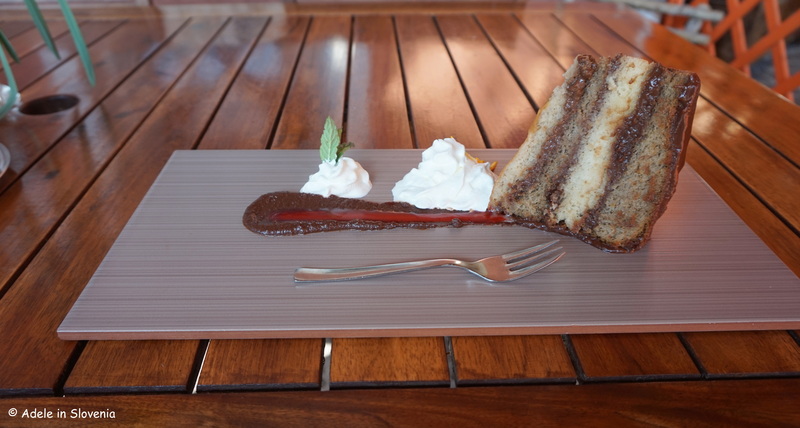 I’d had an insider tip that their house cake – Županova torta – is the bee’s knees, so, well…. it would be rude not to! 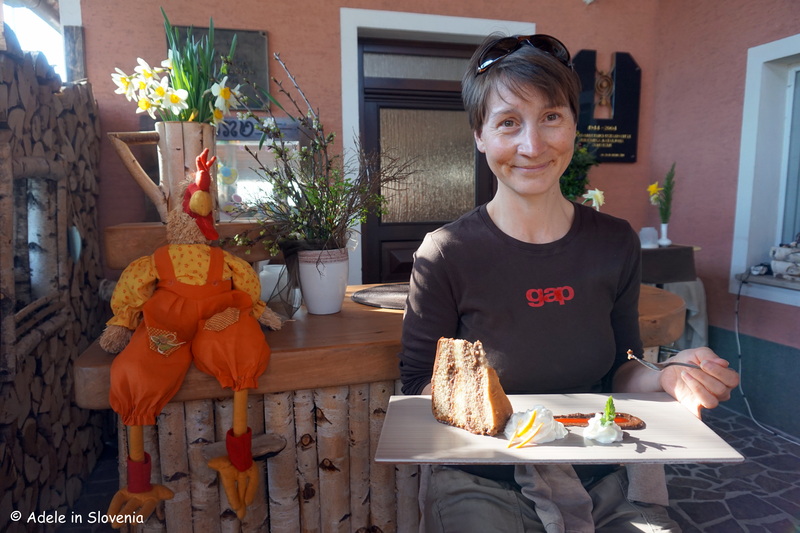 The restaurant also has a full menu of traditional Slovene dishes. To walk off some of that cake, I took a wander on the scenic Path by the Sora river (Pot ob Sori) and along a short part of the Path Along the Rapallo Border, part of which runs along the hilltop ridges above the town. 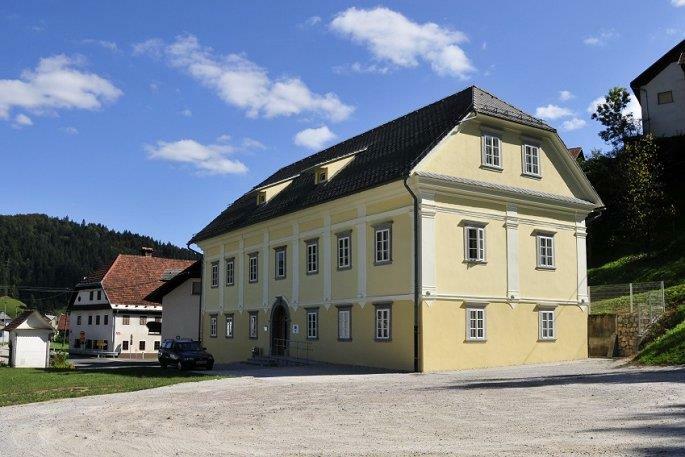 Žiri Museum is open on Sundays from 3pm and 6pm, and at other times by prior arrangement – http://muzej-ziri.si/ (website in Slovene only).